Between 1575 and 1825, a network of underground passageways or mine galleries was created on the western side of Maastricht. During times of siege, these tunnels were used to approach and surprise the enemy from under the ground. Like moles underground, people who dug this 14-kilometre long system of defensive tunnels under the western side of the city in the 18th century. During the Second World War, the people of Maastricht spent many fearful hours crowded together here, sheltering from bombardments. This tour, which lasts about an hour and is led by a guide, gives you a good impression of how and why this unique monument to the art of war came into being. For more information, click here. Extra details: pedestrians walking from the tourist office in the city centre should follow the signs to Bastion Waldeck. NOTE: All standard tours in the Casemates are given in DUTCH. For tickets for tours in Dutch, click here. 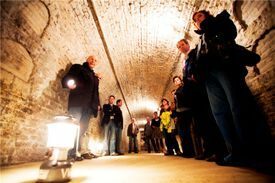 For further information and/or a tailored guided tour in the Casemates, click here. Tip: Join an guided tour in English at Fort Sint Pieter or at the North Caves (DAILY TOURS). All tickets are non-refundable.